Happy Monday, everyone! I have posted previously about Hubby and I working on a political campaign for a local doctor running for the office of Coroner in our parish. The election was this past Saturday. Unfortunately the candidate that we were supporting was not elected. Notice that I did not say “did not win”. Because I felt that he had won in many regards. I listened intently as he gave his concession speech to all of us assembled at the campaign headquarters on Saturday evening. He did it with grace and humility. He had run a positive campaign with none of the mud slinging that has been prevalent in many Louisiana political races. Even when naysayers tried to discredit him. There was a bit of sadness as the band began to pack up and some of the volunteers said their goodbyes. However, everyone that I spoke with had something encouraging and positive to say about the candidate and their experience on the campaign. The general sentiment was everything happens for a reason. A group of us stayed for a while and reflected on the last few months. We spoke about how our goal to elect this candidate had brought people into our lives that we otherwise might not have connected with. We made tentative plans for golfing, boating, and networking. Hubby and I have lived in Slidell for almost 6 years and we’ve met more people in the last two months than we have since we moved here. New friends, new contacts, and…two new babysitters for The Deuce. And I was thrilled to learn on Saturday that my nomination for membership in the Slidell Women’s Civic Club was accepted. The good doctor was not elected into office, but will continue to serve his patients and his community at his practice. That is God’s will and must be where the doctor is needed. My mother had advanced liver disease several years ago. She was on a donor list for a liver transplant. She received a call at home to go to the hospital because a donor had been located. As she and my father headed that way, they received a second call from the hospital stating that it was a false alarm. I am convinced that was not the liver for her. When another donor was located and my mother had a successful transplant and consequently a stellar recovery, the doctors told her the organ was a perfect match. Just stopping by from Click and Chat link up party to say hi. I’m now a new follower of all your social media. Stop by http://www.stuckonacloud.com and say hi to me sometime. I’m looking forward to sharing with a new blog friend! Have a great week! Hi Tiffany! Following you on fb too. Looks like we are both doing #UBP14 as well. Enjoy! I absolutely believe that everything happens for a reason. Sometimes the timing that we have in mind isn’t the one God has for us, so we have to wait it out. In that waiting, other things happen for a reason! I had a pretty hectic weekend, Kimberly. I’m travelling next week, and I’m hosting a Sole Hope shoe cutting party this weekend, so I’ve been ripping and running. But I’m excited about the party, and the trip home for Easter and my mom’s birthday will be great as well. I hope you get a well deserved break because I know you have been working, girl! That said, I wholeheartedly believe that everything happens for a reason — including me having that job in politics, which I despised…I live with absolutely no regrets. Politics can be dirty. My first job at 17 was as a page at the State Capitol. I reflect on things now that I saw and heard that were underhanded. But as a young kid, they went over my head. My son is taking swimming lessons for the second time this summer too. He also loves the water. Thanks Courtney! I struggle with the everything happens for a reason sentiment but that’s a great example of where it makes sense. I hear ya, Kate. I can think of a few things that made me think, “There is no good reason for that to have happened.” But I try to remain positive and think that I’ll eventually find the reason. Even if it doesn’t make sense. Sorry he didn’t get elected but as everyone is echoing, everything does happen for a reason. It is one of the toughest things to accept but usually something good comes out of it. And something has. Thanks Nellie. Sounds like even though he was not elected, he made an impact on people by showing a positive example. He did. Thanks for commenting, Skye. I also believe everything is suppose to happen for a reason and we live, learn and grow because of it. Very inspiring. Yes, we do. Thanks Clancy. What a wonderfully inspiring post. I was in Palm Springs during Spring Break and I saw a 26 foot statue of Marilyn Monroe in her “billowing skirt” pose – I blogged a photo of it. I had never seen this quote by her – and love the wisdom of her thoughts! I’m glad to hear your mom’s surgery turned out well, and I congratulate your candidate on his clean political campaign! Very sweet of you to say, Susan. 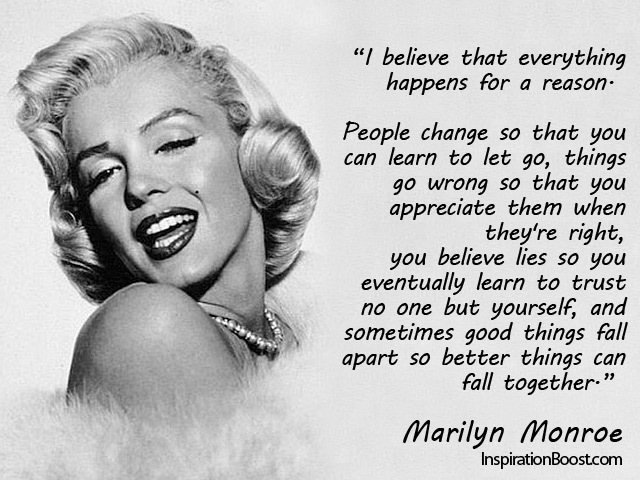 I have always been a big Marilyn Monroe fan. When I drafted the post, I knew I wanted to express that sentiment. I went to Google images for it and there she was! I had no idea she had been quoted saying that. Yes I believe things happen for a reason I am a firm believer in that. We may not understand it at the time but when we look back at things we will see that if this didn’t happen then that would not have happened. Hindsight is 20/20. Thanks Kita! What a great way to meet new people, even though your candidate did not win the election. Congrats on your membership acceptance into the Civic Club! Thank you, Alli! I’m pretty excited about it. Previous post It Is Ultimate Blog Party Time Again!